"Feed the Goat and he will score" went the famous Manchester City chant! 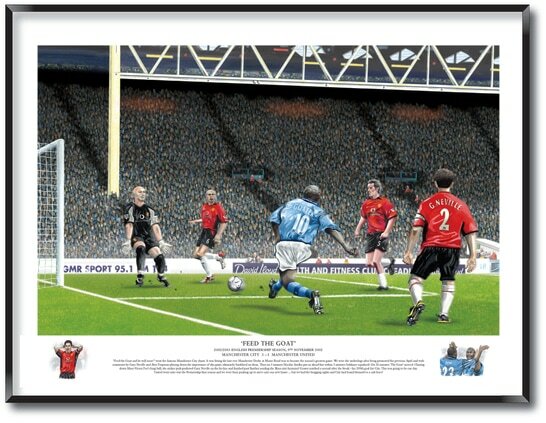 Painted by a City fan, this unique piece of Manchester City art captures the ‘Goat’ pick-pocketing Gary Neville before cooly finishing past Barthez in the last ever Manchester Derby at Maine Road and rubber stamping his cult status! A must for any Blue! Printed A2(420mmx594mm) in size onto 300gsm fine art paper and personally signed by the artist. "Feed the Goat and he will score" went the famous Manchester City chant. It was fitting the last ever Manchester Derby at Maine Road was to become the season’s greatest game. We were the underdogs after being promoted the previous April and with comments by Gary Neville and Alex Ferguson playing down the importance of this game ultimately backfired on them. Then on 5 minutes Nicolas Anelka put us ahead but within 3 minutes Solskjaer equalised. On 26 minutes 'The Goat' arrived. Chasing down Marc-Vivien Foe’s long ball, the striker pick-pocketed Gary Neville on the by-line and finished past Barthez sending the Blues into hysterics! Goater notched a second after the break - his 100th goal for City. This was going to be our day. United went onto win the Premiership that season and we were busy packing up to move into our new home ... but we had the bragging rights and City had found themselves a cult hero!